The Ruf legend began far back in 1939 when Alois Ruf, Senior, first formed his company, Auto Ruf, as a general service garage. Today this same company is stilll at its original location on Mindelheimer Straße in the quaint and quiet town of Pfaffenhausen in southern Germany's Allgäu region. 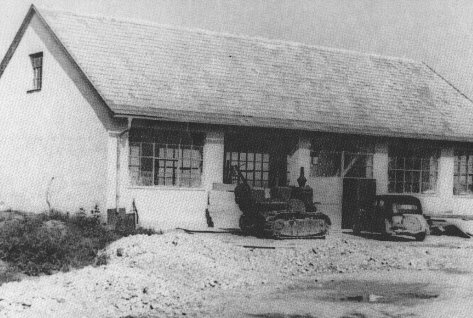 The company grew, despite difficult times, and in 1949 a gas station was added to the company complex. Six years later the senior Ruf, recognizing the growing German interest in travel, challenged his own expertise and developed a full size passenger tourist bus. At that time a very rare type of vehicle in Germany, its success in satisfying the travel needs of many Germans encouraged him to risk further expansion by starting his own separately owned bus company. With his already well-known reputation for detail, courage, and ability to find solutions to important automotive problems, Ruf Sr. expanded his firm's customer base by developing a popular economy car. The strained economy of the early 1950's, high taxes, and gas conservation rules led Ruf to develop a Volkswagen Beetle of redused piston displacement and power but improved fuel economy. It was another success for the firm, becoming popular in the Allgäu region. By the late 1950's, the Italian influence had expanded to Pfaffenhausen. Thus in 1958 the firm added a Fiat dealership so Germans could order their Fiat and have it properly serviced and pampered by Ruf. The company further expanded in 1963 by adding a BMW dealership. While Ruf, Sr. continued to strengthen and expand the company, his son, Alois Ruf, Jr., was developing his own interests and passions for "I art-pour-I'art-idee" in automobiles, the true sportscar. Thus during the 1960's the younger Ruf, driven by his own interests and apprenticed to his father, gained invaluable experience by servicing and restoring Porsches. Ruf company records show that their first Porsche restoration was done in 1963 to one of the now almost legendary 356 models. During the 1950's and 60's, the 356 was a dream car for many sportscar enthusiasts. 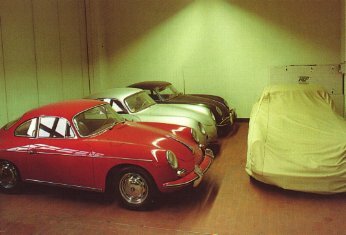 Today these same lovers of Porsche or new enthusiasts can have their 356 meticulously restored to its original condition at the Ruf restoration department. Upon the death of Alois Ruf, Sr. in 1974, Alois Jr. took over the company and continued its development and philosophy of innovation and quality. The success of this formula and his leadership is shown by the current recognition of Ruf as one of the most respected international sportscar manufacturers and suppliers of specialized components. Alois Ruf's understanding of the strength and inherent sporting characteristics of the Porsche 911 led to the company's concentration on this model as the platform for Ruf cars. And what a model he chose! The Porsche 911 was a wise choice, and has proved successful as a backbone of production for the past twenty years. The first of the Ruf enhanced Porsche models made its debut in 1977. The turbocharged engine enlarged to 3.3 liters by using larger pistons had a distinct performance increase compared to the standard Porsche model. This was followed in 1978 by the development of a 217 bhp 3.2 liter version of the six cylinder normally aspirated 3.0 liter Porsche engine (which was far below its true performance potential). This conversion was favorably received by sportscar enthusiasts worldwide and resulted in numerous orders. Recognizing that one of the weaknesses of the Porsche Turbo was its four speed transmission, Ruf responded to customers in 1 981 with their own five speed transmission. It provided distinct performance advantages and driving pleasure for the owners of the turbocharged six cylinder engine. The same year Ruf Automobile received the prestigious and coveted Manufacturers' Certification from the German Federal Vehicle Office. The company's first "work of art" representing the culmination of Ruf engineering advancements for the 911 was brought together in 1983 with the introduction of the Ruf BTR. This model, with a 3.4 liter turbo engine of 374 bhp and five speed transmission was available in either the narrow body or turbo body configuration. The construction of each vehicle began at the bare chassis level in the Ruf tradition of craftsmanship. Ruf GmbH did not restrict developments to the engine, transmission, and chassis but addressed improvements in all areas. These included larger and better brakes and increased width and diameter wheels, which was a novel approach at that time. Together with Dunlop, in 1985 Ruf designed 17 inch wheels using the Denloc System. Originally intended for the Porsche 959, these provided maximum safety for high speed motoring. Developments continued at an increasing pace and in 1987 the newest Ruf high speed sportscar, the CTR, received its certification for normal road use. This incredible "yellow bird" car, a 469 bhp twin turbo coupe, exceeded the world record for production cars on the Nardo Racetrack with a top speed of 211 mph! A truly astonishing speed in the sportscar world! In addition. this same year Ruf GmbH became an approved manufacturer with the U. S. authorities for safety and emissions (NHTSA and EPA). New developments continued and the CTR and BTR became available with a six speed Ruf transmission. Following the success of the 17 inch wheel design, further work led to the introduction of 18 inch wheels incorporating the same safety features. Driving pleasure includes all of the features that Ruf builds into its products. Alois Ruf enjoys his cars as much as do his customers, recognizing that powerful and sporty cars require extra skill behind the wheel for safety as well as to enjoy the cars' true potential.